“Pillars of Climate” is an installation that investigates the issues of perception and dissemination of data in climate change. The sculpture invites the audience to go beyond ‘face value’ and inspect more closely the integration of humanity, nature and fossil fuels. The four scientists depicted in the piece were chosen for their unique carreers [sic], which blend science, communication and activism in climate science. They represent the forward thinking that gives raw data meaning in everyday life. The intersection of science, activism and now art is meant to highlight the recent shift towards making scientific data visible, accessible and meaningful to everyone. The first Pillar of Climate was Vandana Shiva. According to Wikipedia, she is the author of the book Vedic Ecology, which draws upon India’s Vedic heritage, is a “figure of the global solidarity movement known as the alter-globalization movement” and is presently “working on a 3 year project with the Government of Bhutan, at the invitation of the Prime Minister Jigme Thinley, advising the Government on how to achieve their objective of becoming an Organic Sovereign country (the first fully 100% organic country)”. Surely no Climate Audit reader will contest her qualification as a NOAA Pillar of Climate. [she] founded the Green Belt Movement, an environmental non-governmental organization focused on the planting of trees, environmental conservation, and women’s rights. In 1984, she was awarded the Right Livelihood Award, and in 2004, she became the first African woman to receive the Nobel Peace Prize for “her contribution to sustainable development, democracy and peace.” Maathai was an elected member of Parliament and served as Assistant Minister for Environment and Natural Resources in the government of President Mwai Kibaki between January 2003 and November 2005. Again, I doubt that any Climate Audit reader will contest her qualification as a NOAA Pillar of Climate. The third Pillar of Climate may be more controversial. R.K. Pachauri, author of the romance novel, Return to Almora. Wikipedia describes the novel as “reminiscences of a retired bureaucrat, once an engineering student, about his spiritual and sexual past”. While Pachauri’s qualification as a NOAA Pillar of Climate might have been argued about as late as December 2009, I think that the publication of Return to Almora resolved matters decisively in his favor and he is as worthy a Pillar of Climate as his fellow honorees, Shiva and Maathai. He is best known as the lead author of a number of articles on paleoclimatology and one of the originators of a graph of temperature trends called the hockey stick graph because of its shape. The graph was highlighted in an IPCC report receiving both praise and critics, and has been the subject of a long-running controversy. Mann is also known as a founding member of the Real Climate blog, to which he and a number of other scientists contribute. I realize that some readers may argue against Mann’s inclusion in this galaxy of Pillars. However, I urge such readers to think long and hard about the connections between the Mann hockey stick and Vedic ecology – a scandalously under-researched topic. Let’s hope that this display leads to renaissance of research in this area. The juxtaposition of Mann with a Kenyan Pillar also reminds us of Mann’s deep and profound connection with Kenya, where Mann combated the transfer of resources from the Third World to Europe and the US – a transfer that is all too characteristic of the globalization decried by Pillar Vandana Shiva – by re-locating Spanish precipitation to Kenya in Mann et al 2008. The testimonial to Pillar of Climate Mann also shamefully ignored his important contribution to the alter-globalization movement through his development of novel statistical methods that enabled the use of bristlecone tree ring chronologies and upside down Kortajarvi sediments to reconstruct world temperature – alter-globalization at its best. While the testimonial to Mann properly recognizes Real Climate as a scientific authority of equivalent stature to Pillars of Climate Vandana and Maathai, the testimonial can only be regarded as a first step towards the recognition of RealClimate. NOAA should immediately commission Pillars of Climate II, a similar display recognizing the accomplishments of Gavin Schmidt, Rasmus Benestad, Eric Steig and the rest of the Real Climate gang. Let’s all hope that reason prevails in Washington and this worthy program is preserved. This entry was written by Stephen McIntyre, posted on Jul 30, 2011 at 1:45 PM, filed under Uncategorized. Bookmark the permalink. Follow any comments here with the RSS feed for this post. Both comments and trackbacks are currently closed. I notice the “Pillars” fon’t seem to support anything. Who says art doesn’t reflect reality ? Rather weakens your conference when you pay homage to the hockey stick. I guess they hadn’t got the memo yet. Steve, your wit is at least twice as sharp today as that of, let’s say, Martha. … or maybe a word that starts with P and rhymes with hillocks? Hmmm. Fish in barrel meet shotgun. I urge such readers to think long and hard about the connections between the Mann hockey stick and Vedic ecology – a scandalously under-researched topic. Let’s hope that this display leads to renaissance of research in this area. Vedic science may refer to a number of disciplines: ancient and modern, scientific and unscientific, religious, metaphysical, Hindu, occultist, New Age, proto-scientific, or pseudoscientific found in or based on the Vedas. Which discipline to choose to shed the fullest light on our esteemed third and fourth pillars? I sense this is too important not to be crowdsourced. Geez, what an ego-fest. Not even “Pillars of Climate Science” – but “Pillars” of the very climate itself. And with all that ego, and all that money, they can’t even spell “career”? Yeah, I’m a Pillar of climate, and boy, are my arms tired. I see a face! I see a face! If I squint just right it looks like…Spider Man! Well, with polka dots but, ahem…never mind. No, not Spidey – it’s Red Skull! Dear SM: Your encomium to the Four Pillars of Climate is eminently praiseworthy in itself. I believe that your contribution will do much to insure the future funding of such essential governmental expenditures as the Four Pillars sculpture. However, I wish to point out an apparent erratum, most likely created by your amanuensis: “…the rest of the real climate gang.” “Gang” is obviously a stenographic mis-insertion, sounding crass. “Hierarchy” is more nearly the correct word. Please amend the text accordingly. Who was the artist? Victor Vasarely? Roy Lichtenstein? or another knock-off type? I’ve been working on my own climatic-artistic homage to Al Gore, James Hansen, Phil Jones, and R. Pachauri at my abeqas site. Sadly no donors to fund a larger megasculpture quite yet. What is its carbon footprint? Taking a wild guess here but the artist commissioned this piece for at least six figures; minimum. A masterpiece of mordant drollery. And every word rooted in objective truth. No one could have so achieved that combination but you, Steve, and no subject but Climate Science could have so richly deserved it. All the great artists subvert their patrons. I would not discount the possibility this sculptor is one of them. Anyone else notice that the Pillars of Climate look suspiciously like an homage to the ex-World Trade Center? Rather contrary to the green message, that. And all those variegated dots — as a decorative motif don’t they subliminally recall Warwick Hughes map of the suspiciously — and yet so conveniently — hot Siberian climate record? And the four Pillars themselves — such low-hanging fruit (a double irony in this image). One is left to wonder just what the artist really intended. Stealth cynical hilarity? Maybe, Steve, the artist was counting on you to open the hidden box of goodies for us all to see. Al Gore called. Since he will not be appearing on Mt Rushmore, he wants to know why there is not a 5th Pillar reflecting his humble efforts. I think Gore may have to settle for fifth column instead. Pillars of salt, presumably. Looks to be quite a good clothes horse – with addition of some hooks and wire, of course. Hats off to the designer. Well, we now know where congress can be cutting the budget without harming anything useful. Had to laugh out loud by the time I got to the end of this article! Good job Mr. McIntyre! What happened to the good old days of conferences in Arusha and Tahiti and PR Challenges in Wengen and Trieste. As an American taxpayer, I feel like I’m getting off cheap. If you’re going to post on this thread, please refrain from comments that are merely angry. I think that there’s a useful place for satire, but angriness is mostly unpleasant. Personally I don’t think Mr McKintyre should indulge himself here in censorship of those who want to come here and express their Vedic Anger at being mocked so effortlessly. It’s a bad look falling into the ways of Team Vedicism. As we know the dedication of these ladies and gentlemen to gentle education and equalizing subsidies, I eagerly await my free copy of Dr Pachauri’s lovely book. But upon what would the spotlight be? I can think of a lot of things to suggest, but nothing nice, so I’ll just leave that alone! Maybe a miner’s headlamp or flashlight illuminating a dark cave would be a better monument? Are two sore thumbs in this display. NOAA should immediately commission Pillars of Climate II, a similar display recognizing the accomplishments of Gavin Schmidt, Rasmus Benestad, Eric Steig and the rest of the Real Climate gang. Hey!!! I think its time Canada chip in for such a worthwhile project!!! Jeez, and they want to raise the debt ceiling? This stuff, we just gotta have!!!! Just can’t figure out why the public seems so angry these days. Stupid, @^#@# imbecilic ….#$%@#@# moronic…q4@#%@!^@ 100% Organic country!?!?!?!? What the heck does that mean and why does anyone think it could possibly be a good thing? You can’t pull this trick on me. A very serious organisation like NOAA would never, never promote rubbish like this. Apologies, they’ve just done it. Since all the snarky or satirical comments and good jokes have been used in previous comments, let me be a contrarian and say I like the piece’s concept of an image of each “Pillar” being visible as you walk around the piece. Spelling and word usage would lead me to believe the artist is not a native English speaker, and apparently didn’t know one well enough to proofread their text. I do have three questions, though. Which male “Pillar” are we looking at? Why are there apparently no other pictures of this piece on the Internet, besides Steve’s? Wanting to do a reality check on my assumptions and satisfy my curiosity, I spent way too much time doing various image searches and even websearched the Conference without finding out anything. Can anybody help? Need Samson to hold up those pillars. They are on thin (melting)ice. These guys are not yet beyond parody as evidenced by Steve’s superb piece. But in another year or so the lunacy will have gone beyond even his abilities. It is a sad day when the the hard science part of NASA at the Kennedy Space Center is being defunded while the science fiction part of NASA (Goddard Institute for Space Studies) marches on and on and….on. Should be right up his alley by all accounts. The Climate Parthenon seems a bit rickety. Though, at least they can see clouds to imagine HS shapes in the sky. Truth is stranger than fiction. You just can’t make this stuff up… but you can mock it! Ok, that did evoke a smile. Nicely played Steve! I pay less than two thousand pounds in tax each year. For a small charitable donation (payable to me, as trustee) I can tell you how it’s done. Alternatively, I have recently completed a major art installation. Were you to purchase such a worthy (and surprisingly expensive) piece, I feel almost certain that you could write-off huge swathes of lucre for tax purposes. My installation is titled “Are you pleased to see me, or is that a Pillar of Climate in your pocket?” It’s in the shape of an enormous pair of trousers. “Pillars of Climate” is an installation that investigates the issues of perception and dissemination of data in climate change. This wording clearly shows this to be part of the “spin” campaign that The Team and IPCC have mounted, to make it all about HOW you tell the public and pols, not WHAT you tell them. Three, someone at NASA GISS was tasked with counting them. Three pillars, 4 scientists. Which scientist has been hid by the decline? lol, there is one other possible explanation……. Dude!! The 4th pillar drowned in the storm. Each pillar has 4 sides. Each pillar-side shows 1/3 of a scientist’s face. You probably have to walk around the pillars to pay proper homage to the Pillars. We get to see a different side of each of them. If we wish. I have always had trouble keeping my temper, especially when confronted with anything that suggests fraud, dishonesty, or intentional falsehood. The only way I could stand “Climate Science” was to give certain individuals the benefit of the doubt, and to imagine their errors were not intentional. However I could only do that for so long before disbelief would set in, and I’d hit the roof. I’d like to thank you for this site, for, besides being an example of patient, long-suffering truthfulness, it has also taught me quite a lot about keeping my temper. Sadly, by the looks of things there’s probably not enough left upstairs for LSD to do them much good, huh? A final question: When NOAA’s Budget Office receives news of a diminished budget for 2012, will they see the connection? Kudos to AL Gore who appears to have been involved in the release from jail of Wangari Maatai at one point in her incredible life. While growing up you’re repeatedly taught not to judge by appearances. Nevertheless, poor Mr Mann looks *exactly* like the kind of guy who would actually feel genuinely flattered by being included in such a group. So yes, we might say the same of climate data. It, too, is part of nature and has a right to flow free! Still unclear to me is the exact mode of jigging enjoyed by Jigme Thinley. Could someone please explain? Damn, that’s an ugly carpet. One of the risks in academia is to place academics on pillars, putting them above and disconnected to the unwashed masses. Note how the sculptor cleverly avoids this impropriety by putting people on the _side_ of the pillars rather than on _top_ of them. Perhaps in subsequent efforts the honorees can be placed _under_ the pillars, or perhaps just in the pillar’s shadows. Just as long as the pillars aren’t placed on the shoulders of giants. As someone who’s painted and drawn all their life, I’d have to say that this is a case of science imitating art. I paint people. When I finish a painting, it looks like them. I’ve ‘caught’ something about that person. Occasionally it doesn’t work but that’s what makes it a challenge. That’s the discipline. Art has moved away from depicting real things like people and the world we live in. Since nobody can work out what the “artist” meant by their latest work, it nearly always comes with a long name or a neat little card explaining it to us less artistically perceptive souls. Of course, with this decoupling from reality, people can quite successfully pass of daubings by a Chimpanzee as high art. That’s been done too. Post-normal science and its effect on science is exactly analogus except the chimps are a tad easier to spot. I think that “art” came from the siding of a Control Data building that was demolished in 1978. If Mann gets a pillar for free flow of information, what does Steve get? Mann is placed on a pillar, taxpayors are placed in a pillory. Don’t forget “The Painted Word” by Tom Wolfe. A classic of its genre. NOAA is becoming more in touch with its spiritual side, it seems, by advocating the temple-like semblance of this poorly executed piece. Are artists and scientists so different? No, there are incompetent artists just like their are incompetent scientists. Their juxtaposition in the ‘pillars, says a lot about the communications capability of NOAA. NOAA is accelerating in the direction of an increasing lack of public trust. Ed, I know you’re a regular contributor to Pierre’s site. I haven’t been able to open the home page for his place for the last two weeks. Is he having technical problems? I think it ironic that the second Pillar of Climate – Wangari Maathai from Kenya – is the one actually working against the CO2 meme. HER cause is one of reforesting the trees on the slopes of Mount Kilimanjaro – that icon in Al Gores movie. Because SHE knows that it isn’t CO2, rather changes in Land Use that have had an impact on the snow cover…. What a great poem that skewers human hubris! snip – please stop this sort of angry statement. Perhaps we have thus far under-considered NOAA’s selection of pillars and their connection with the Vedic art advocated by Pillar Vandana Shiva, in which the Shiva linga is essential. Pillar Pachauri’s novel is a sort of homage to the Shiva lingam as well. Perhaps this is the deep connection to the Hockey Stick that we’ve been searching for and which the artists have intuitively grasped – the Hockey Stick as Shiva lingam. No wonder the connection to Vedic art is so important. 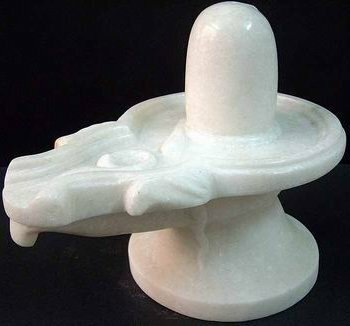 Other Shiva lingam images are here. One might even say that the “Hockey Stick” is an important motif in ancient art. Steve, this is comedic gold! A true consilience has occurred. Nice image… so this is what short-centering is all about? The second one is we’re readers of books and dare I say it, the occasional one that’s got nothing to do with science! Why, there’s even some Shelley being quoted. Anyone want to contribute some Yeats “slouching to armageddon” to keep the warmists happy? snip – let’s stay with satire. In antiquity, pillars or monoliths, were usually, dare I say, phallic symbols. This seems not much different. Certainly the monolithic label could apply. The linga [Hockey Stick] is not just the organ of generation, but a sign of the progenitor and the essence of cosmic manhood manifested in the microcosm. By worshipping it we are not merely deifying a physical organ, but recognizing a form that is both eternal and universal. Perhaps this is the artist’s way of saying that with ‘science’ like the hockey stick, we are all pucked. Well, like most model “scenarios”, it made me pale when I saw it. again, I remind readers that I discourage references to current politics. NOAA has provided us with much low-hanging satirical fruit (so to speak). If you are unable to discuss Pillars of Climate without using terms like “left leaning” or “Obama”, you are in the wrong spot and your comments will be removed under editorial policy. I really enjoy this blog, and the comments on it. The only thing that I don’t like is the constant torrent of cringe-worthy OBN posts. (OBN – The Order of the Brown Nose – see Private Eye magazine.) Any chance the brown-nosing could be reined in a tad? Much obliged. Reason 2122.34 that I’ll never become a member of the AMS unless my profession absolutely demands it. After 24yrs in the field I haven’t found it necessary yet. Some vehicles do have rather impressive rears that could contribute to the drivers overall status. This is a good case for a FOIA request to US Department of Commerce (that oversees NOAA): Who ordered the construction of the pillars? What’s the cost of it? On what ground were the materials on the pillars chosen? If you think four pieces of plastic wouldn’t cost too much, you will be surprised. (This is government, after all.) Moreover, if NOAA receive the request they will have to think twice before doing it again next time. “Pillars of Climate” – award winning art inspired by climate change and produced by UNC Asheville MLA students Sean Aguirre Buckley and Katie Descieux. 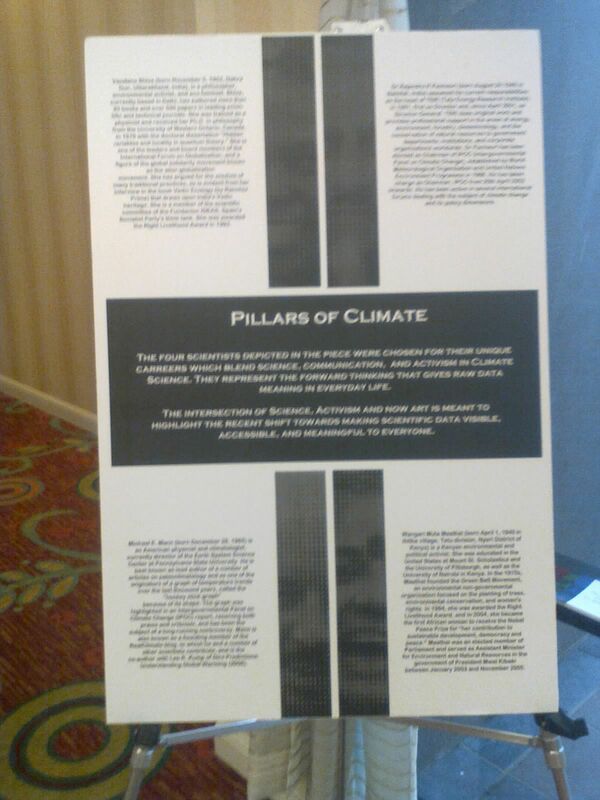 Its also worth pointing out that the pillars appeared at an American Meteorological Society (and American Association of State Climatologists) meeting, so complaints over the choice of featuring student artwork is better directed at them. Looking into it a bit more, it looks like some folks at the NCDC “collaborated” with the student’s course study. So technically the time that a NOAA employee spent collaborating with their class might be considered a taxpayer cost, albeit a rather small one. As I understand from my source, the NOAA logo was prominently displayed on the Pillars. Further, the NOAA logo is shown on the Facebook link to which you directed me. A comment on this link seems to imply that it will soon be an exhibit at the NCDC. Sean Aguirre Buckley next stop: NOAA’s NCDC! Steve: it’s good news that NOAA is getting in touch with their Vedic selves. Doesn’t seem to much NOAA budget in it,from the list of sponsors. In fact,no acknowledgement of NOAA support at all…. “Chakras are energy centres which govern the subtle, psychosomatic aspects of our inner being. The chakras open up like flowers and pour out their qualities re-establishing our inner balance and restoring our health and form. I noticed that in your photo one portrait was made up of red dots and one was made up of blue dots. What were the colours on the other sides, and who was blowing hot and who was blowing cold? The Pillars don’t go very well together with the carpet pattern. Redecoration and repainting is necessary to underscore their aesthetic quality and uniqueness. Isn’t there a kids game with wooden blocks that can be rotated to form pictures of people from the various images on the blocks. Imagine the different combinations you could achieve with these pillows . . . sorry, pillars. What would a Mann-Pachauri-Mann face look like? Could keep me occupied for seconds. Steve, Will you please remove any reference to NOAA sponsoring this art work? My wife and I paid for it. NOAA had nothing to do with it. The David and Marjorie McGuirk Fund sponsored the art competition that resulted in the Pillars of Climate. Why do you insist on lying in your blog? 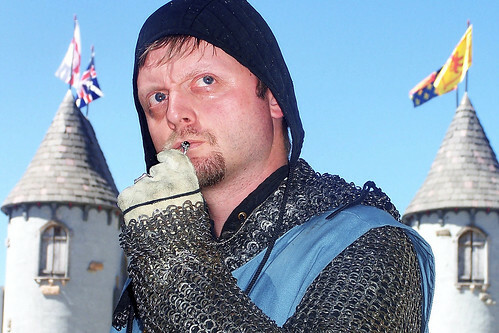 Are you a very strange person? Do you hate private enterprise? What’s wrong with you, anyway? What a nasty and disingenuous rant. The NOAA logo appears on the “Pillars of Climate” Facebook page (linked below, h/t Zeke) — if in fact “NOAA had nothing to do with it” then it is the (mis)use of the NOAA logo that would be “lying” about sponsorship. A sponsorship is not only financial, since there can be a variety of “in-kind” and staff or non-monetary sponsorships (which often still cost money indirectly from a budget, hence it is still relevant to ask about federal costs associated with this so-called “art” as presented at the conference. IF you and your wife via your foundation were the sole financial supporters then the FB page is also lying about that, since it lists FIVE other sources of “generous contributions” below yours. Even if it turns out that NOAA did not lay out dollars to the contest or production of the “art” (sic) itself, it is entirely reasonable to see the NOAA logo on the page, plus the sentence which informs the viewer that the project aims to “showcase the collaboration between NOAA’s National Climatic Data Center….” and infer that NOAA is one “sponsor” of the project. Indeed, if ANY NOAA staff time or resources went to enabling or publicizing or displaying this “art” then NOAA can be reasonably described as a “sponsor”. IF you want to pretend it is wrong to attribute sponsorship to NOAA, there should have been an explicit statement to that effect on project materials. Use of the NOAA logo on project materials implies sponsorship of some sort. Indeed, most organizations, public and private, have strict approval requirements for where and how their logo and name may be used. An organization’s logo is legally protected, and it is not even legal to slap the NOAA logo on just any project one wants to present to the public. If NOAA is not in any way a sponsor of this project then it will be appropriate for US citizens and taxpayers (I am one) to complain formally about the misuse of NOAA’s logo for a purely private enterprise. I am so in favor of private enterprise that I detest people and organizations which misuse “public” facades for their own private activities. Did your project do this? Marjorie McGuirk is a meteorologist and climate specialist with NOAA’s National Climate Data Center in Asheville, NC. There she works with business, industry, and professional associations in agriculture, architecture, energy, engineering, hydrology, landscaping, and transportation. In recent years she served as the Special Advisor to the Director, as Chief of Staff, and also as National Partnership Liaison with Regional Climate Centers and State Climate Offices (RCC & AASC)…. David should try posting the “Airmiles” insignia beside an ad for a product where the buyer will in fact receive air miles. No can do – you’ll get a letter telling you to take it down or else. David is out to sea, McGuirky as that may be. Heh, a beanball lined back in the pitcher’s face. Kim, as a baseball fan I greatly appreciate that analogy, even if real life hitters are reduced to diving out of the way if they can…. I’ve never gotten over what happened to Tony Conigliaro when I was a young pup…. Marjorie Petty McGuirk These guys are insane. Press on Michael! Steve, Will you please remove any reference to the pilars? What’s wrong with you, anyway? That is too funny. Nice job Skiphill. “For more information on Mann’s talk, contact Michael Neelon, UNC Asheville assistant professor of Psychology, at 828.250.2359 or email mneelon@unca.edu.